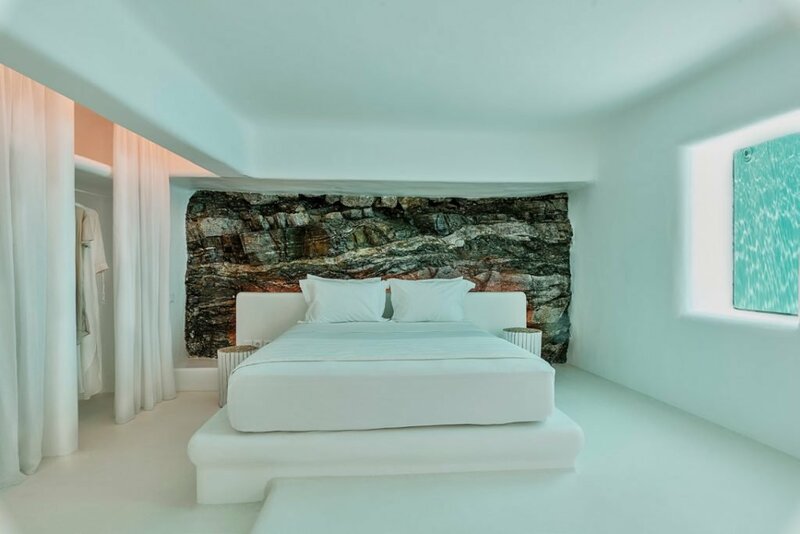 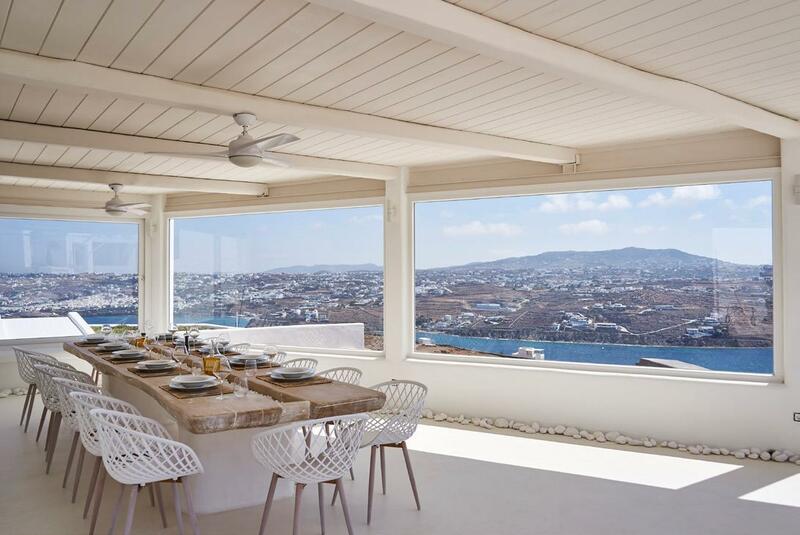 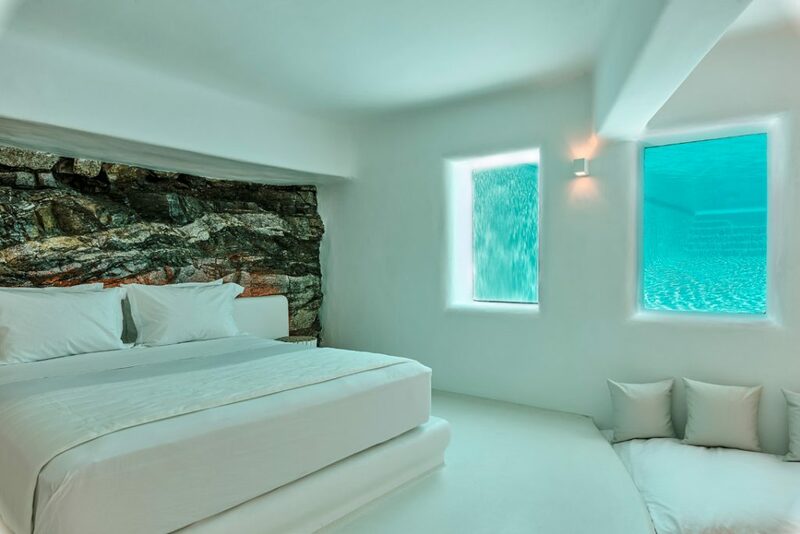 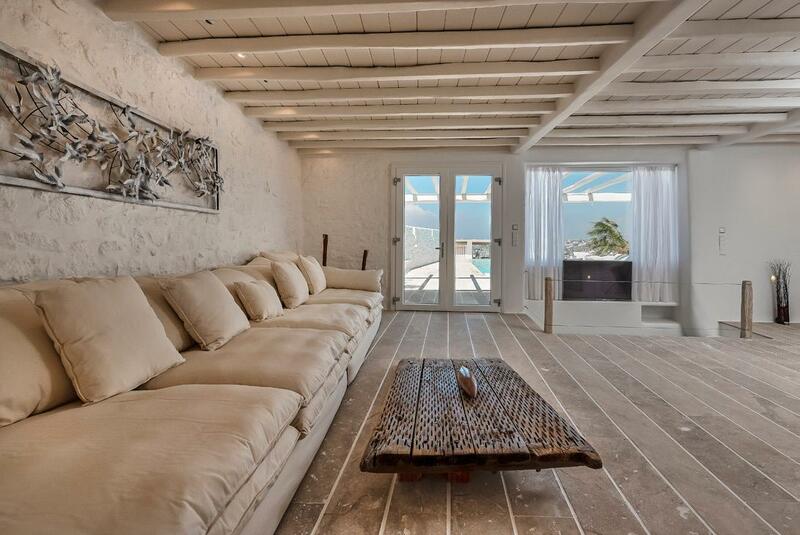 Villa Harold (650 square meters) is located at Pouli area of Mykonos and it has a panoramic view of Mykonos Town, the port of Mykonos and Ornos. 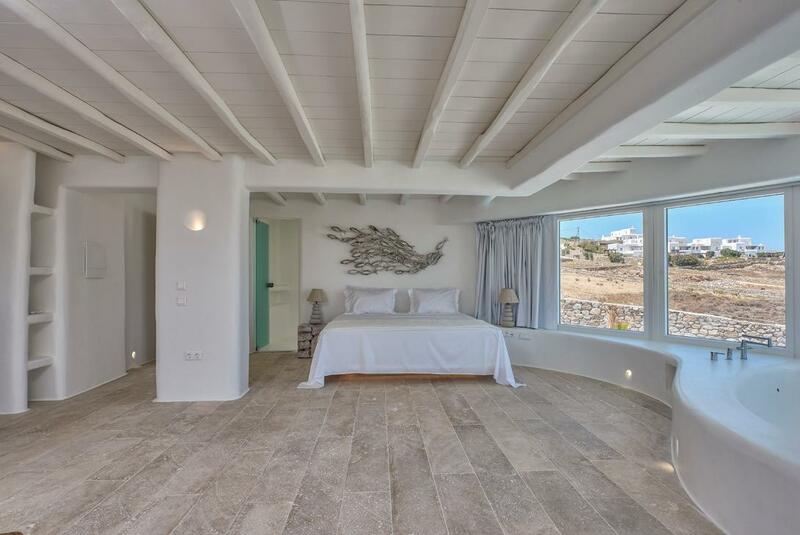 The plot, on which the villa is built, is 1.200 sq.m and it is fully configured at different levels which are oriented towards the stunning view of the island. 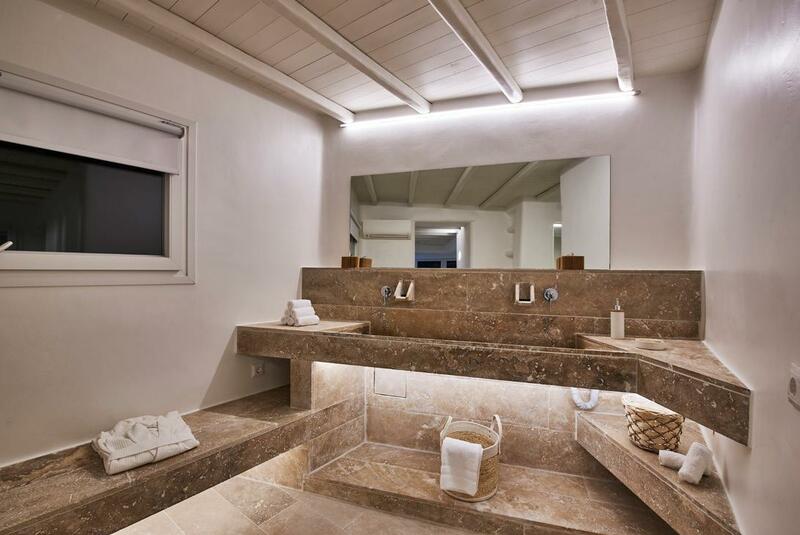 The predominant colours are white and the beige tones of raw limestone ‘travertino’. 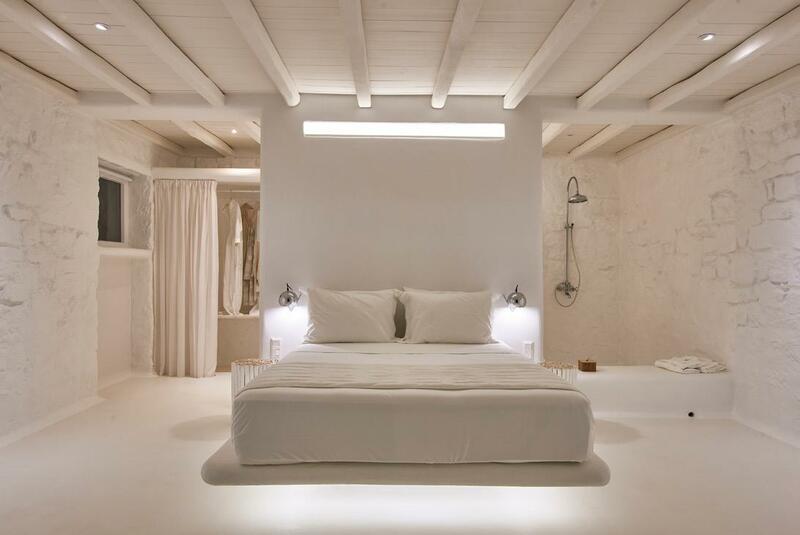 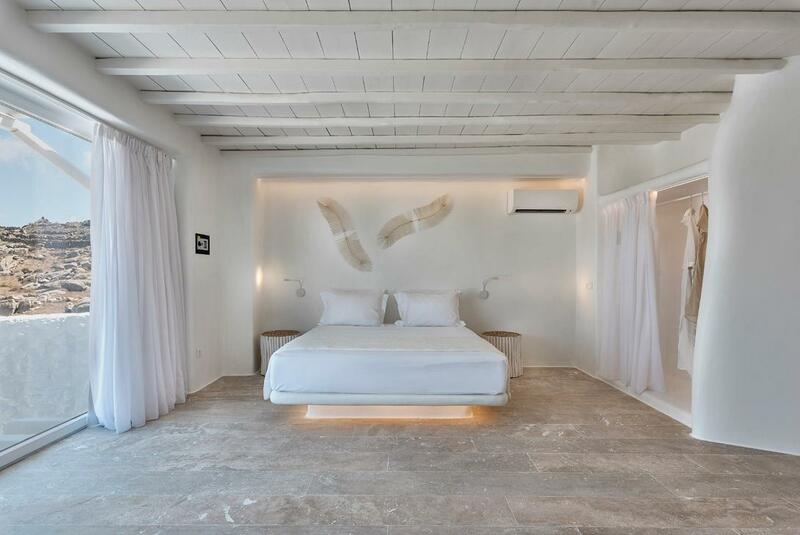 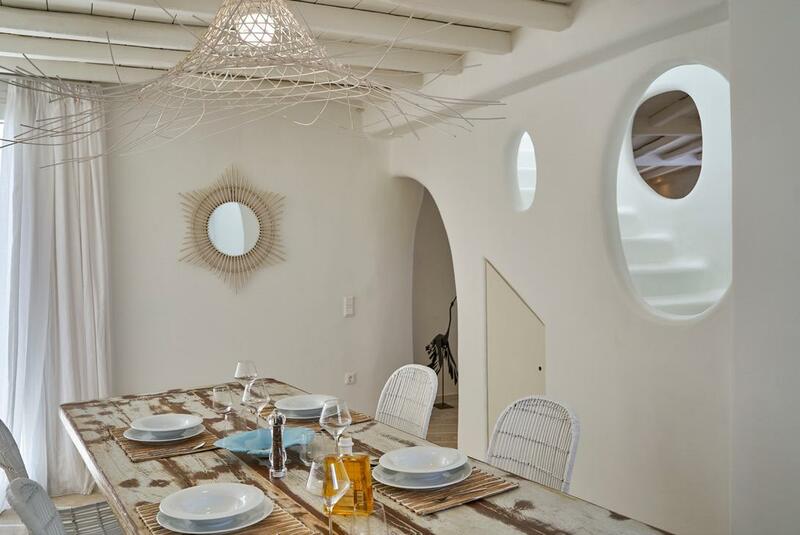 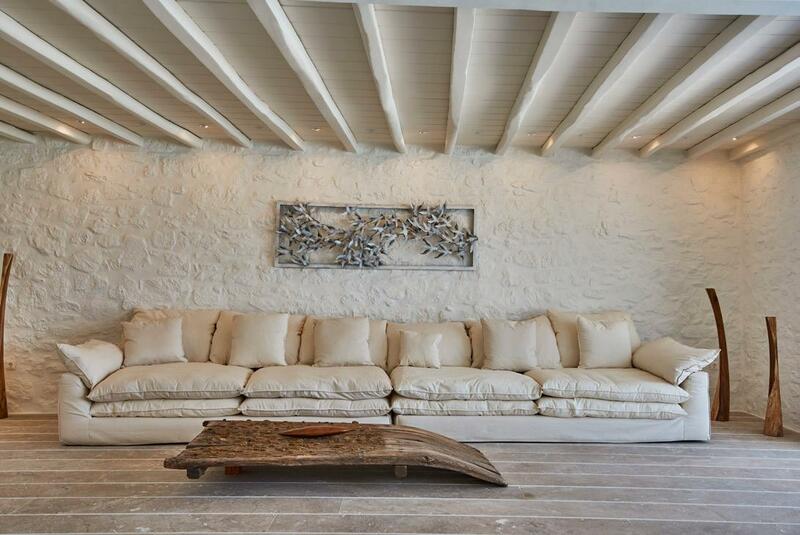 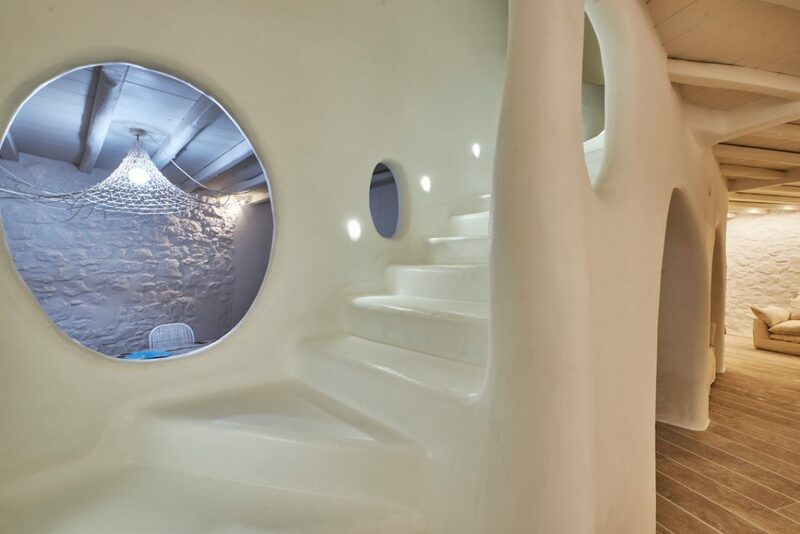 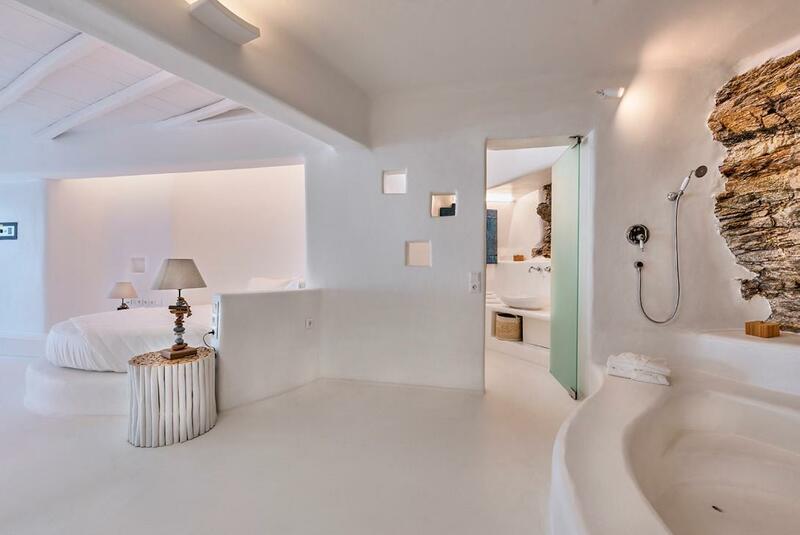 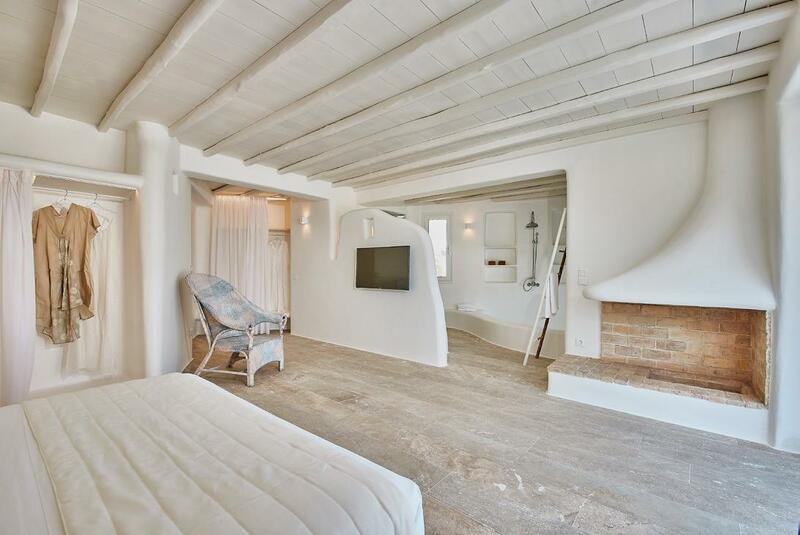 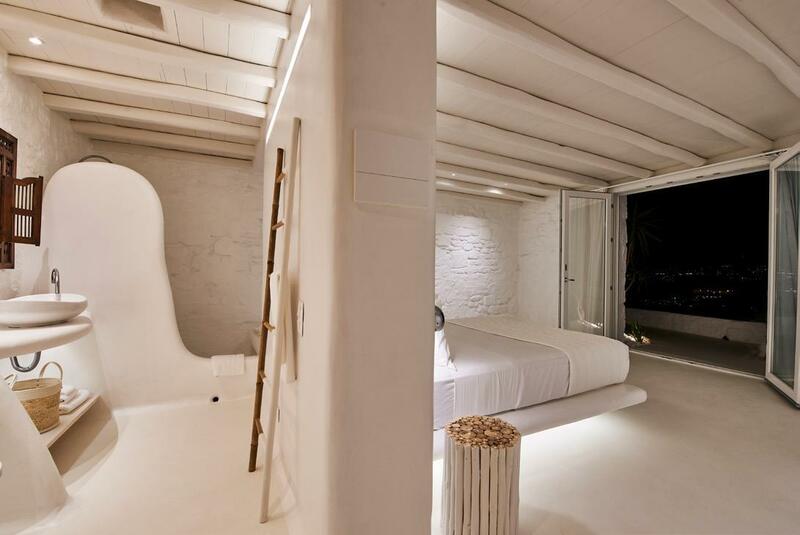 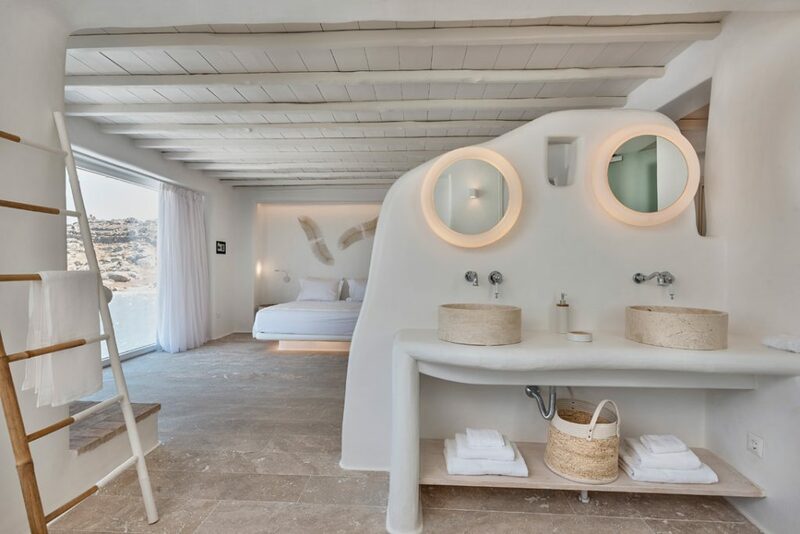 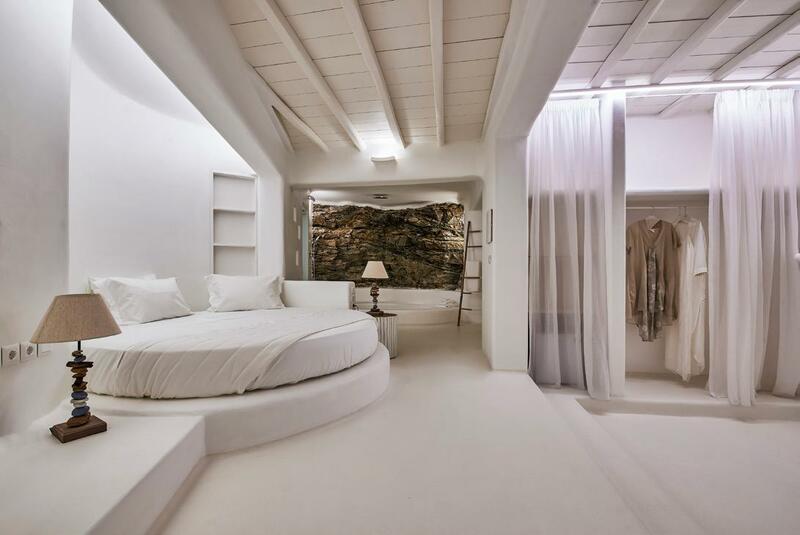 The amazing architecture of the villa is characterized by a strong sculptural style with predominantly elements of Mykonian tradition, in combination with art and minimal influences. 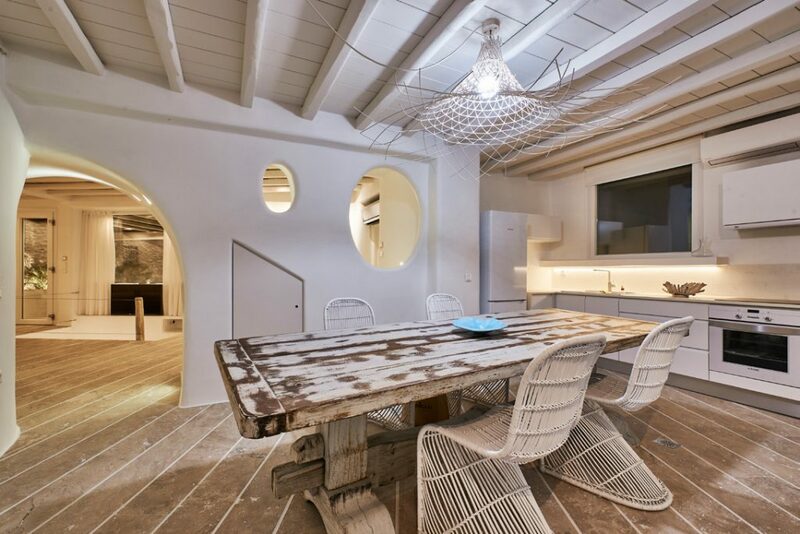 This creates an exotic and dreamy elegant atmosphere. 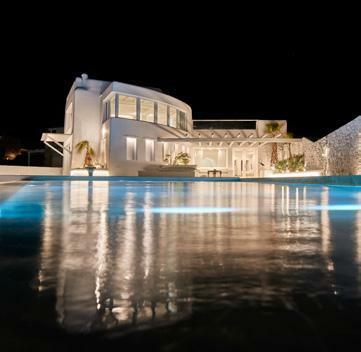 The villa’s main swimming pool 150 sq.m overflows with perimeter waterfalls in two smaller pools and a hot tub for 6 people. 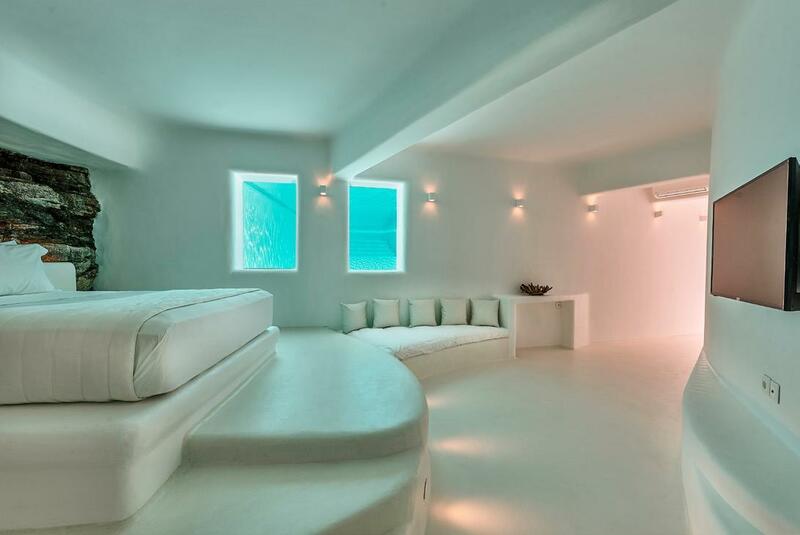 These two are below the main pool and at different levels. 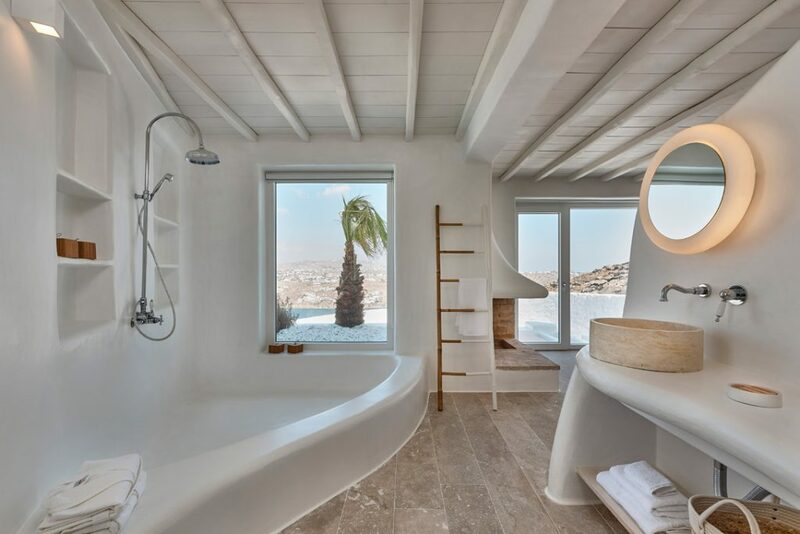 The main pool is located at the middle level in the center of the courtyard and is surrounded by marble floors of 500 square meters, with 3 large built-in outdoor living rooms with lovely pillows and panoramic views of the bay and the island of Mykonos. 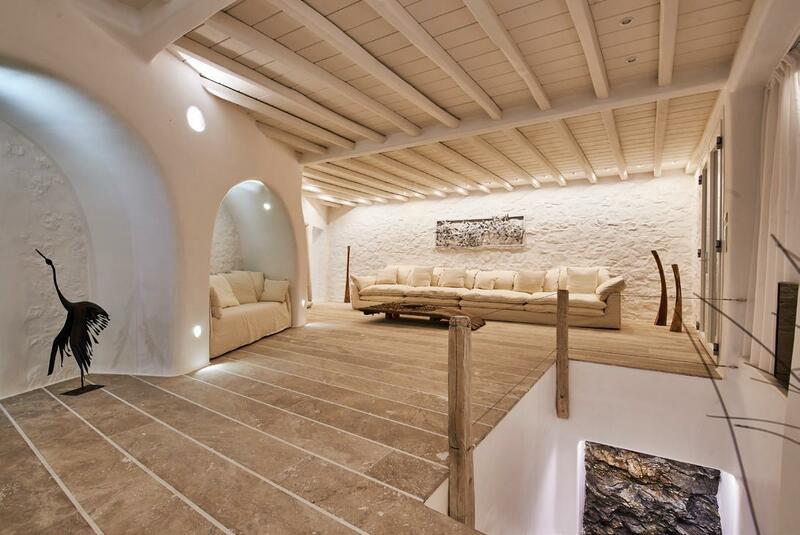 Tall, round white stone walls define it and ensure its privacy. 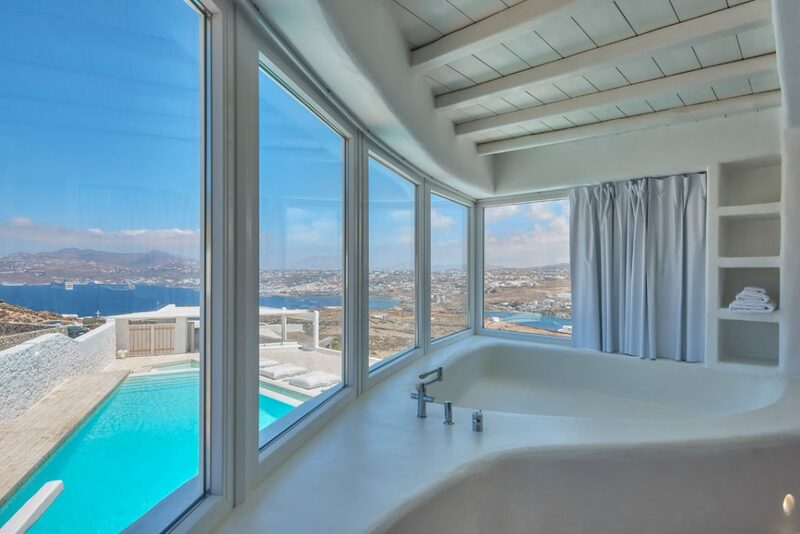 It has 2 external entrances, the main one leading to the central level with the pools and the covered outdoor dining area – barbecue, while the second entrance is on the highest level and serves the Top Master Suite. 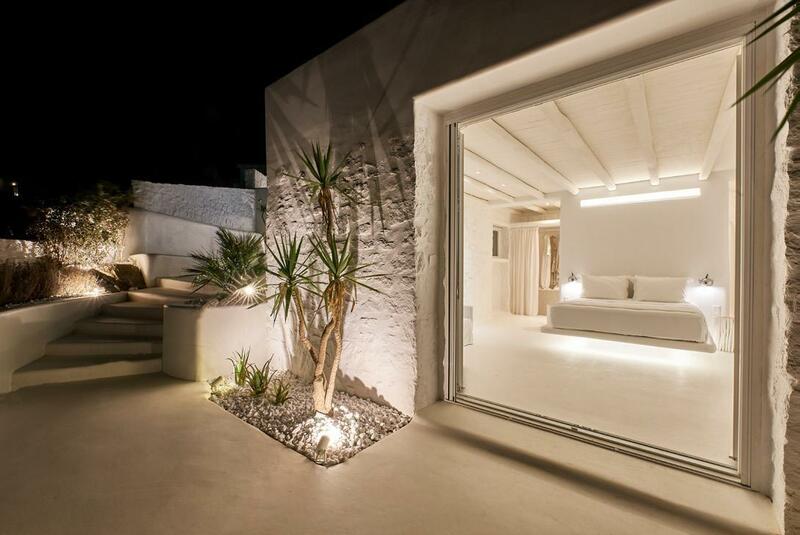 Outside these entrances are 5 outdoor parking spaces. 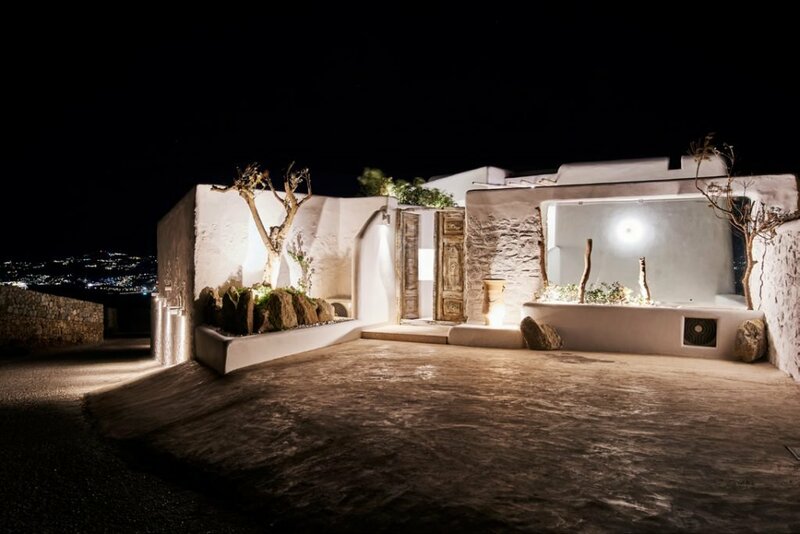 The villa extends into 3 levels which communicate with each other with internal and external stairs. It consists of 8-10 large independent bedrooms, all with their own bathroom, and an auxiliary room with an internal bath. 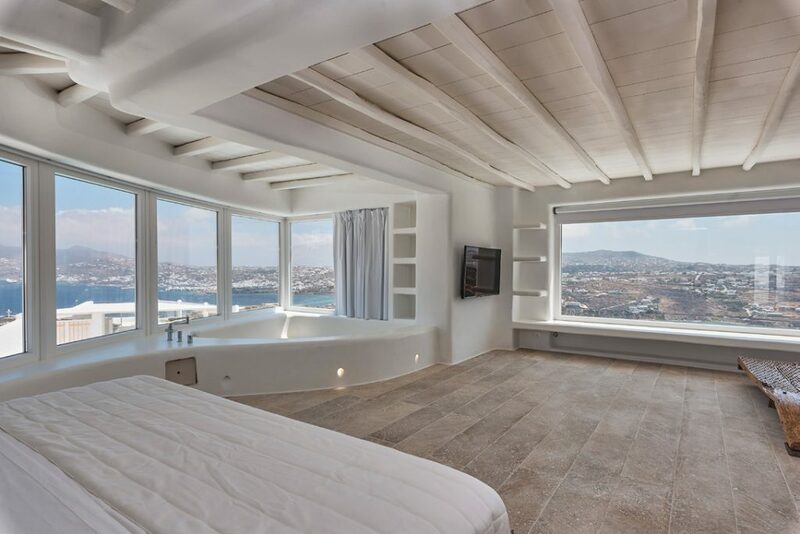 At the top level is the Top Master Bedroom (90 sq.m), surrounded by large windows with panoramic view and an exclusive 60 sq.m terrace with a hot tub and outdoor bar. It also has an internal and independent exterior entrance and private parking. 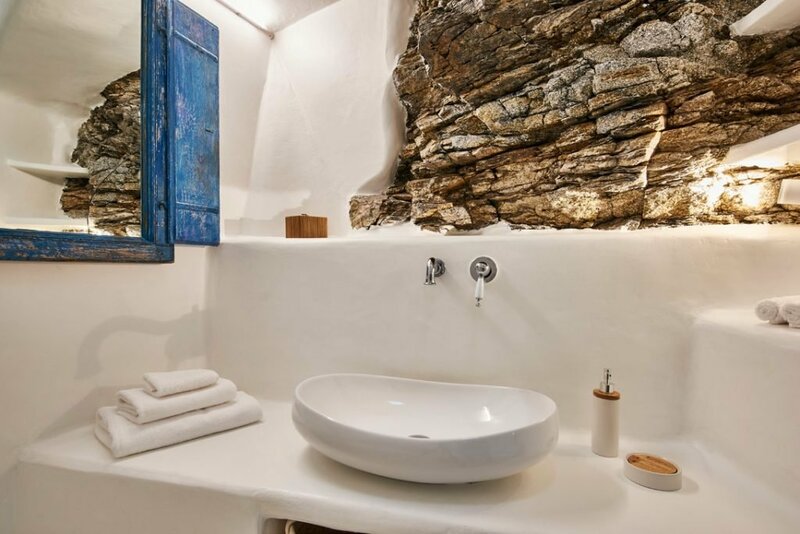 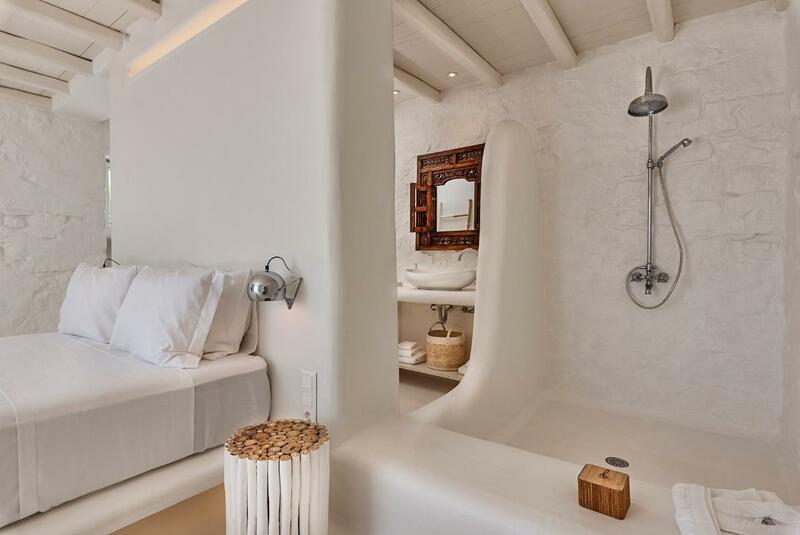 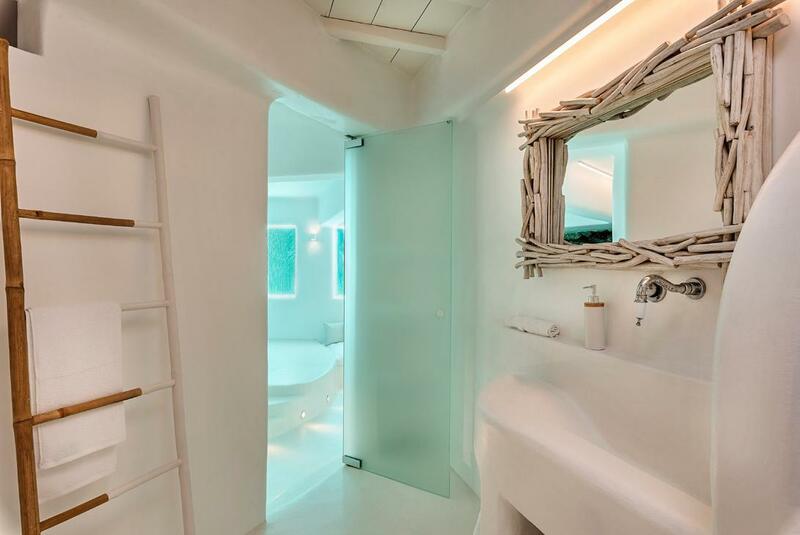 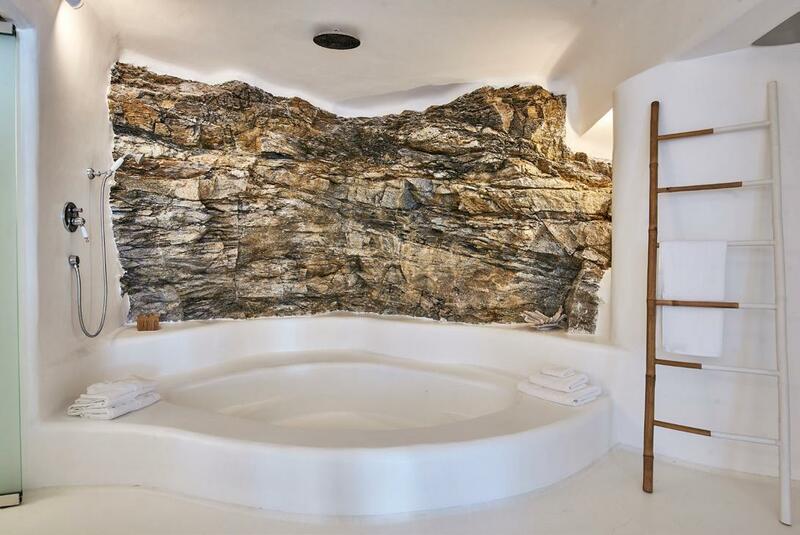 Inside there is a large built bathtub with stunning view, an independent shower room, impressive marble-built washbasins with traditional faucets, an independent WC and a large dressing room. 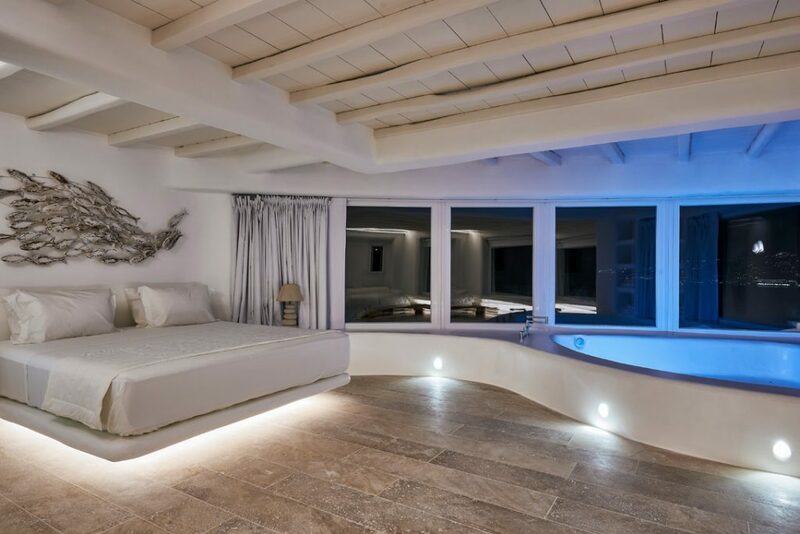 In the middle level, at the level of the central swimming pool, is located the living room and the interior kitchen of the villa. On the other side of the courtyard there is the covered-protected area (100 sq.m), with the outdoor kitchen – barbeque (fully equipped) and the large impressive handmade dining room for 18 people. At this level there are also two bedrooms. One, which is 50 sq.m, with stunning sea view, open bathroom and private terrace and one, which is 30 sq.m, in a backyard with a strong traditional atmosphere. 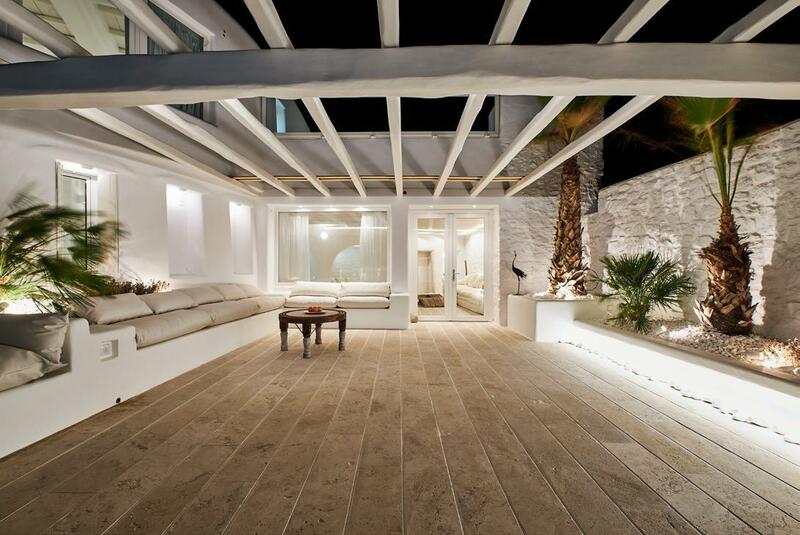 In the backyard there is also the utility room of the villa (15 sq.m).